Derek Gladwin conducts research on and teaches primarily in the areas of environmental humanities and ecocriticism, social and spatial theory, and postcolonial and Gothic studies. 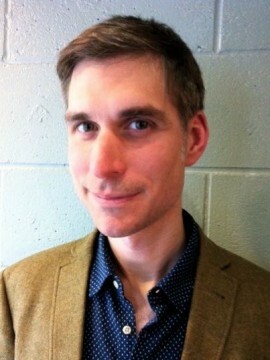 His cross-disciplinary and intertextual research and teaching focus on modern and contemporary literature and culture, as well as film and visual culture, and examine the geographies and cultures of Ireland, the United Kingdom, and the North Atlantic (Nordic countries and part of Canada). Gladwin has taught a range of courses in literature, visual culture, writing studies, and folklore and mythology. His recent articles on environmental and spatial criticism and postcolonialism have appeared in international journals, such as Irish Studies Review, Photography and Culture, Gothic Studies, the Canadian Journal of Irish Studies, and Visual Culture in Britain. He has also co-edited two books: (with Rob Brazeau) Eco-Joyce: The Environmental Imagination of James Joyce (Cork University Press, 2014) and (with Christine Cusick) Unfolding Irish Landscapes: Tim Robinson, Culture, and Environment (forthcoming, Manchester University Press, 2015). In addition, he is the recipient of the Governor General’s Gold Medal Award (2014) and the Vanier Canada Graduate Scholarship (2011-14), among other awards. Currently, Gladwin is co-editing (with Maureen O’Connor) a special issue on “Irish Environmental Criticism” for the Canadian Journal of Irish Studies. He is also working on two books: one is titled Spatial Justice in British and Irish Literary and Visual Cultures, which explores social injustices related to space, power, and geography, and the other is about contemporary North Atlantic culture. Gladwin’s work can be followed at the Academia.edu site.